One of my favorite things about The Man being on the East Coast is cooking together. I am lucky enough to be marrying a guy who loves food as much as I do, and he’s a great cook. Plus he’s one of those people who can look at the contents of my pathetically empty fridge and create something incredible, whereas I have to plan every meal. So when The Man announced that Saturday was going to be Mexican Brunch day, I was overjoyed. One thing about us – we love Mexican food. LOVE. And Mexican food for breakfast is pretty much the icing on the cake. Cream cheese icing. On carrot cake. It’s that dear to us. I already had a beef roast in my freezer, so we pulled that out to thaw in preparation to make machaca for breakfast. I think I’ve mentioned machaca before, but if not, it’s a mexican shredded beef dish with onions, tomatoes, diced chilies, and all sorts of delicious spices. Ohmyword, so good. 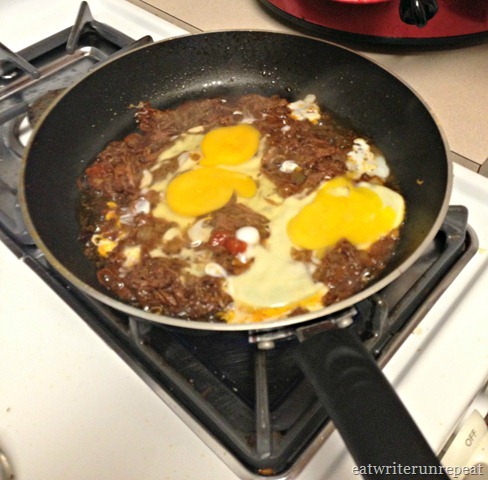 For some reason my machaca never turns out as good as The Man’s, so I was happy to turn the kitchen over to him. Just look at that luscious spicy beef! So good, I can’t even describe. 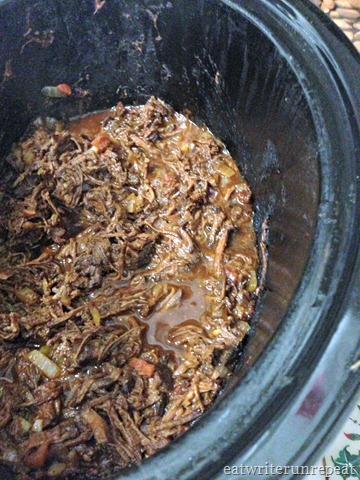 Even though it doesn’t look so good in this picture…trust me, it’s darn good beef. As with any traditional Mexican breakfast, we scrambled eggs with our machaca and served them in corn tortillas. 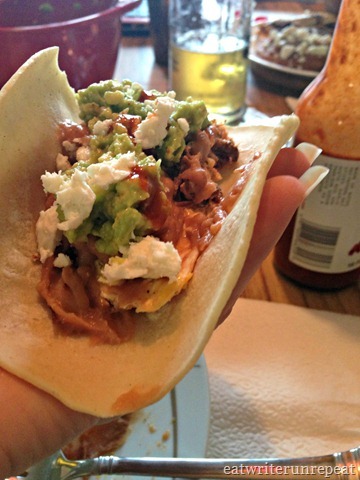 Then we topped them with refried beans, guacamole, onions, queso fresco, and tapatio. Love me some tapatio! 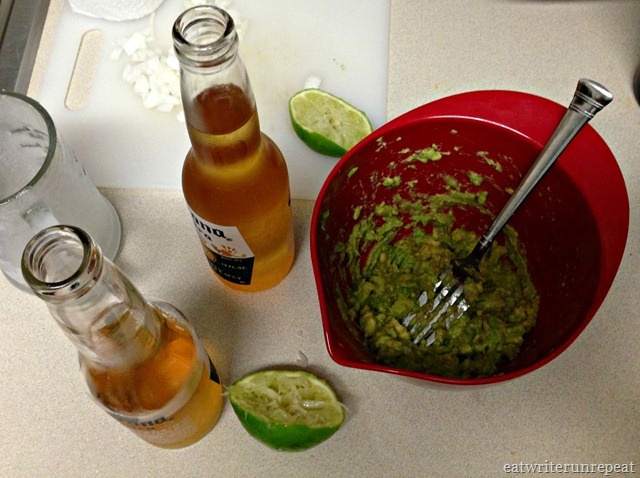 And of course, you can’t have a Mexican meal without beer! Funny story about that, actually. The last time I was in CA (before the Big Event) we went to our favorite Mexican place for breakfast. Normally we’re the only ones there but this particular visit was different – several tables were occupied. After looking around for a few minutes, sipping on my black coffee, I realized something: everyone else was drinking. Everyone. There was a table of guys in the corner drinking beer. The couple next to us had glasses of white wine and something made with tequila. Another table have several rounds of Bloody Mary’s. The Man was quick to explain that it’s perfectly normal to have a beer with your chorizo at 0900. And here I thought restaurants couldn’t serve alcohol before 1100! (At least, they can’t in Pennsylvania.) Who knew?! 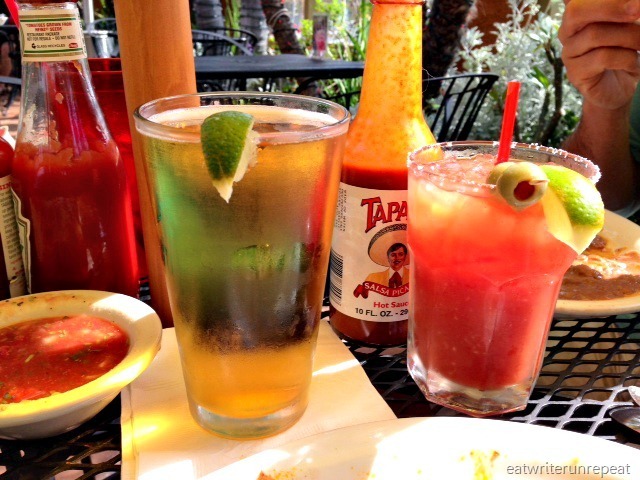 I couldn’t be the only table not drinking (hello peer pressure), so we quickly ordered a Pacifico and a Bloody Mary. Totally made the breakfast. So of course, we cracked open some ice cold Coronas with salt and lime and served them alongside our machaca con huevos. Delish. 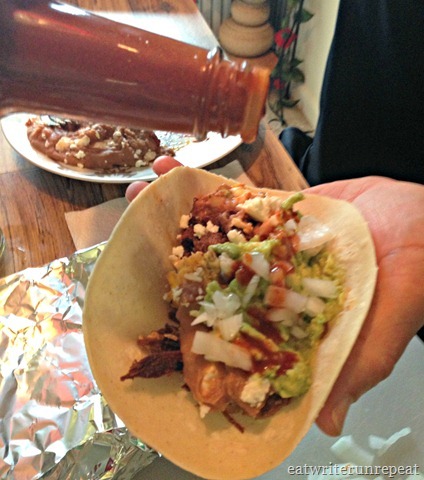 Adding a little tapatio to the tacos…everything tastes better with tapatio. I don’t know what it is about Mexican food that makes it so darn good, especially when half the time it looks like something…well…something not really all that appetizing. Take refried beans, for example. There is absolutely nothing aesthetically pleasing about refried beans, but holy cow I can eat a lot of them! 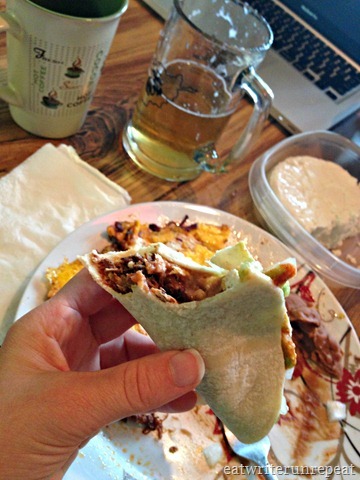 Have I mentioned we really love Mexican food? No? Posted on 6 August 2013 1 October 2015 by BeePosted in Beef, Beverages, Booze, Breakfast, Crock PotTagged beer, booze, breakfast, crockpot, machaca, mexican.